Topic: (Start of) A map for 5 tribes. 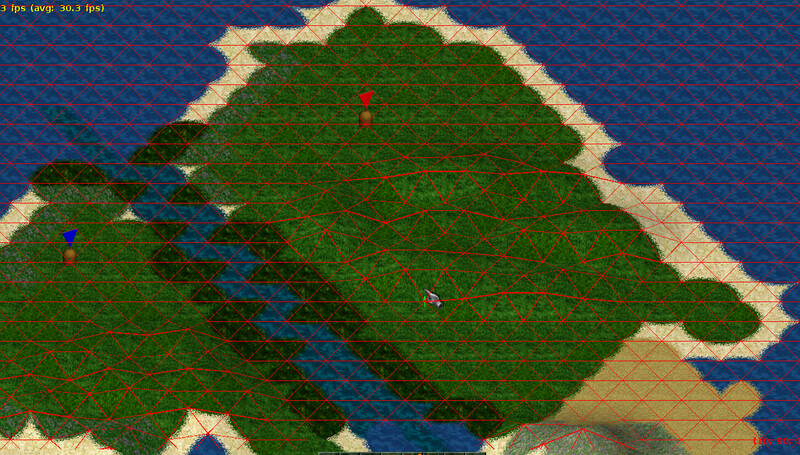 Forums » Player Forums » Map Editor Forum » (Start of) A map for 5 tribes. I started working the other day on making a map for an island to house 5 tribes, purely for fun. Currently I have a pentagon outline and 5 section borders, and it struck me, that some people might be interested in using that as a base for their own map ideas. It's not quite perfectly a pentagon, but near enough, I think. Anyway, you can get it from here. Let me know what you think, if anything. But as I said, nothing much to see, there, yet. I took a quick look at the minimap: It was probably quite some work to get the triangles shaped out fairly - we truly need better tooling in the editor. Ah, yes, don't use zip all that often, anyway, fixed it and replaced the file you get when you follow the link. Yes, had a spreadsheet on my other screen with coördinates of various important points, and with a combination of math and trial and error, I drew in the various sides and borders. Most points have been filled in with single clicks, and it would have been much easier, had there been a way to click a start and an end point and "draw a straight line". But I'm sure things will get faster once I get more used to the editor. Just made a map to experimentally measure the lumberjacks speed per tree, by creating a hexagon of trees for one, and hopefully having left some reachable spots to see and place the lumberjack. The posted image is just a mockup (composition). Currently it is not possible to have such a grid displayed. @Lokimaros: Why didn't you use the automatic zipping of maps? Then you don't need to zip the files manually. Just take a look in "Options -> Saving -> Compress data files..."
I turned it off because I want to get under the hood of Widelands, see what makes it tick and when the counter reaches zero and the bombs go off. Keeping all of them unzipped helps in that case, otherwise I'd get unzipped maps all over the place making a mess and confusing me as to what I was doing where and how.